Over the generation, research methods have been strategically modified to fit consumers on a large scale. With ongoing competition from various sectors, it is remarkable how the market research reports have been going around. One such analytic approach is the method of SWOT Analysis. It has a definitive purpose of serving insides of any sectors key threats and weakness along with several other constituents. 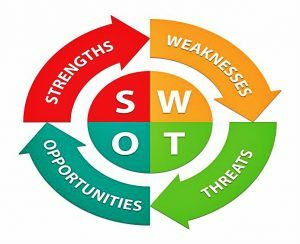 As explained SWOT analysis is a strategic planning method used by several organizations or individuals to perform better while identifying several strengths, weakness, opportunities and upcoming threats. It is a fundamental assessment that grasps the tendencies that an organization or individual needs to adapt to have a clear conclusion of future aspects and threats. Depending on specific business sectors, several categories are listed that holds on to the process of interpreting a SWOT analysis report. Strengths: This aspect provides the characteristics that a business can modulate to behave extensively in the competition. Certain strategies are included in the market that makes it uniformly more powerful than its matches which are disclosed in this aspect. Opportunities: These include the aspects which the business or company can exploit itself to gain maximum advantage over others. Counting on various opportunities in the marketplace provides a grasp as to what key factors can be utilized to enhance the upshots of these opportunities. Weaknesses: These accounts for the characteristic that posses the business or the individual’s project a disadvantage ground over its counterparts. Having a sound knowledge of these would make the weaknesses tackled and grow over time and become opportunities. Threats: The specific elements of the environment that can pose a threat to the business or individual’s project are termed as threats. SWOT analysis help in monitoring the environmental businesses that can have a negative impact on the overall growth of the company or project. SWOT analysis guides tremendously leading the new path for business, by modulating the strategy meetings. It’s beneficial to have everyone involved to gather and have an open discussion on the core value and strength of the organization. Consequently, the path is then accomplished by defining the opportunities and threats with tremendous ideas that can be developed later on. SWOT analysis even paves a path before a specific session is changed, informing the company about various factors that it is unaware of as well as difficult to capture in long term. A specific organization can use the SWOT for its overall business growth and strategy sessions. Using this method can see above the strategies developed by SWOT and filter down the segments that can be used in building future aspects before committing on to it. Furthermore, it can be used to perform growth over the marketing and sales component. As an achievable method, a company can look into reverse methodology accounting over segment specific SWOT analysis that often feeds into a specific gesticulation. While getting on to a SWOT analysis, a suitable way goes to have the clean chart to start off with. Having a hold on the four quadrants and outlining the content is the next step. Consequently, at the same time, it is advisable not to let the entire group lead without preferences. The business which are extremely segmented, leads appear in separate areas and the chances of having more specialized knowledge along with strengths and weaknesses are more. In rare cases, a more detailed segment analysis is required to fit in gaps of a relatively higher segment. Nevertheless, just a single SWOT can capture all the basic requirement of a company and can help it overcome barriers in the initial stage. The first step requires to encapsulate every single thing from the groups and companies involved. Consequently, when the pace takes off, the next process involves eliminating the duplicate entries to ensure that each and every listing is perfect and according to the required market segment. Lastly, it is required to lead the group through reasoning, do it without any pre-entry of combined concepts. The building of this group would help in adding and removing insertions within the SWOT chart, distilling to a mutually agreed process. Posted in Market Research Reports, SWOT and tagged Market Research Reports, SWOT analysis.